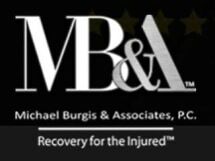 Michael Burgis & Associates, P.C., is a highly experienced, full-service, one-stop shop for all of your urgent workers' compensation, employment law and personal injury matters in Southern California. MB&A effectively handles all aspects of litigation from start to finish with efficiency, professionalism and zealous advocacy. If our team does not personally retain your case, we make it our mission to refer you to the most skillful attorney from our trusted network of qualified colleagues. We carefully screen all of our cases and only refer our clients to the best of the best in the appropriate field. We understand that being involved in a legal case can be stressful and thus our goal at MB&A is to provide recovery for the injured not only financially, but also medically and emotionally. MB&A strives to build longstanding relationships with our clients, emphasizing personalized individual attention. Our skilled legal team fully assesses the client's medical and legal needs in seeking the maximum recovery under the law. We are the compassionate, knowledgeable lawyers who aggressively advocate for our clients. MB&A carefully investigates the facts surrounding each individual claim and swiftly assesses the strengths and weaknesses of the case(s). By doing so, we are equipped to negotiate extremely favorable settlements for our clients. We do not give up and will never shortchange our clients if a favorable settlement cannot be reached, we will take the case to trial until maximum benefits are delivered. The firm primarily represents individuals who have sustained an injury on the job or who have been subjected to unlawful discrimination, harassment or retaliation during their employment. We diligently obtain the maximum award while minimizing tax liabilities and Social Security offsets for our clients. We are also highly experienced in more complex legal issues involving the Subsequent Injuries Benefit Trust Fund, Social Security, state disability, retirement, structured settlements, vocational rehabilitation, prosthetics, home health care services and home modifications. We don't make promises we can't keep and always stay true to our word. In the past eight years, no workers' compensation attorney has successfully handled more cases in Van Nuys than our firm's founder and managing partner, Michael Burgis. Mr. Burgis is a well-respected attorney who prides himself on honesty, respect and integrity when it comes to dealing with his clients, judges and the opposition. Your initial consultation is free and you owe no attorney fees unless we recover damages and secure benefits for you. You will never be asked to pay a dime because we personally take on expenses related to investigations, retention of expert witnesses and the like. We are not like other law firms. We are re-defining representation with one goal in mind - obtaining a recovery for the injured. Give us a call and see for yourself. Hablamos espanol.